​Back by popular demand! Our adorable mascot returns to the world of Garage Kits with a brand new litter of pups. Formerly released through Necronomi-Concepts way back in 1995 and inspired by the works of H.P. Lovecraft and Frank Belknap Long this insanely lovable Tindalosian Hunting Hound puppy is desperately looking to become YOUR best friend! And when he arrives at your home he’ll have a few personal items to start him out happy and healthy. 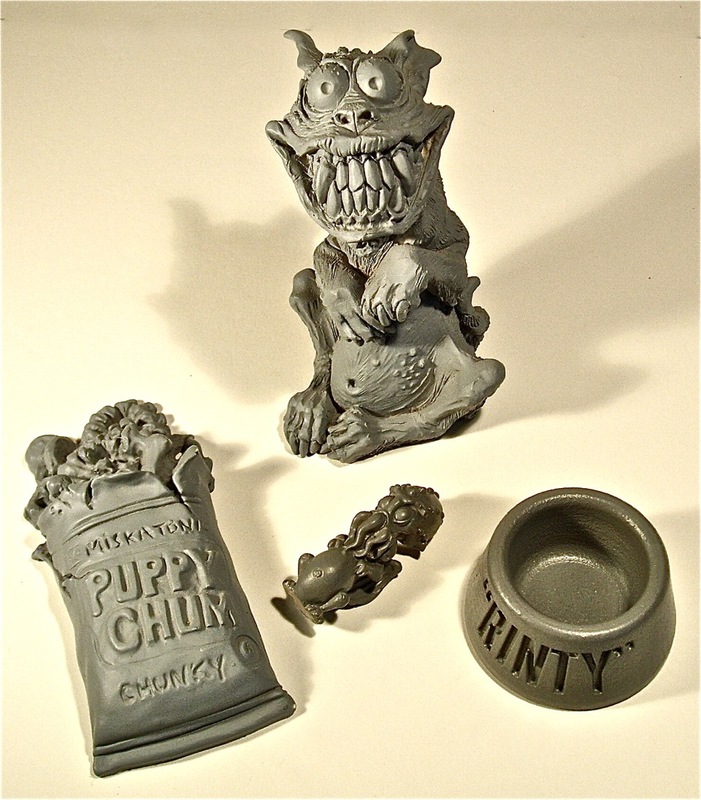 In addition to his drool-generating bag of Miskatonic Puppy Chum he comes with a brand new water dish personalized with the name RINTY and his very own patented CT-CHEW-HU teething toy! But wait…that’s not all! Just like years ago your new pup comes with a bonus sheet of newspaper, The Arkham Herald, for housebreaking purposes and a spiffy Certificate of Pedigree signed and numbered by the artist. Rin Tin Tindalos is slightly over 4 1/4” tall and ready to leave the kennel NOW! All 4 parts are cast in solid white resin. No need for any assembly just pick some colors and paint him any way your heart desires. Though Rin Tin Tindalos is irresistible to all ages he is recommended for adult modelers only. Still as adorable as he was back in the day! Me like, me want!